Finding a web content filter for managed service providers (MSP) that meets every clients´ needs can often be a difficult and time consuming process. The ideal web content filtering service for managed service providers often has a long list of requirements, many of which are not available in standard Internet filtering products. A great number lack robust security features and granular controls, making it difficult for them to be adapted to match individual clients´ requirements. However, providing a web filtering as a service for clients does not have to be complicated and labor-intensive with minimal net margins for MSPs. It is possible to seamlessly incorporate a suitable and cost-effective web content filter for MSPs into existing client packages, as well as attract new business from companies seeking a fully managed Internet content filtering and WiFi security product. An effective and robust web content filter for MSPs needs to have bulletproof security features and highly granular controls to adapt to the different needs of each client. Implementation should be straightforward and should not create integration problems with existing systems. Since clients’ needs frequently change, and clients are added and removed regularly, a web content filter for managed service providers must be flexible and allow changes to be easily applied – often at short notice. Additionally, if anything goes wrong, the MSP / ISP needs to offer excellent technical support and customer service to rapidly resolve issues. Offering a third party branded product carries a risk of a client cutting the MSP out of the equation. A web content filter for managed service providers should therefore be available in a white label version – allowing the MSP´s branding to be applied. Ideally, it should also be possible to host the solution within an MSP´s infrastructure. For many MSPs, finding all these features in the same product is a difficult and time-consuming process – which is not always successfully concluded. This is why we developed WebTitan Cloud. Our cloud web filtering solution for MSPs offers all these features and removes the hassle from implementing, maintaining, and managing a web filter for multiple clients. Our multi-tenanted web content filter for MSPs allows managed service providers to seamlessly integrate web filtering into their existing client packages in order to increase client revenue and attract new business. Don´t All Web Content Filters for MSPs have Bulletproof Security Features? Not necessarily. All most web content filters for MSPs have a “blacklist” filtering mechanism to compare requests to visit a website against a list of those known to harbor malware, not all support SUBRL and URIBL filtering to prevent network users visiting websites that have been constructed with the sole purpose of executing phishing attacks. Some even fail to provide SSL inspection – a vital element in detecting malware and ransomware disguised within the content of encrypted websites. Although SSL inspection can drain network resources at times of peak Internet activity, as WebTitan Cloud´s filtering engines work in the cloud, network users can access the Internet with imperceptible latency. WebTitan offers a web content filter for managed service providers with a difference. We have tailored our product specifically to meet the needs of MSPs, allowing them to offer a new service to existing clients and attract more business. WebTitan Cloud is an easy to implement web content filter for MSPs requiring no software downloads, no additional equipment purchases, and no staff training. There are no restrictions on bandwidth and no limits on the number of end user connections. Since our web filter is DNS-based there is no latency. Internet speed is unaffected, regardless of the number of users connecting to the solution. 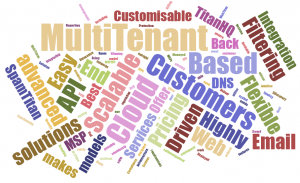 We can provide a white label version allowing MSPs to incorporate their own branding, and offer three different hosting options – WebTitan Cloud can be delivered within our own cloud infrastructure, can be deployed privately for each client via AWS, or MSPs can host WebTitan Cloud within their own infrastructure if they wish. It only takes around 20 minutes per client to configure WebTitan Cloud. No advanced technical skills are required to set up or manage our web content filter for managed service providers and, since it is API driven, WebTitan Cloud can be easily integrated into back-end systems. The TitanHQ MSP Program has evolved from our experience of working closely with MSPs since 1999. With a deep understanding of the SMB marketplace, we have developed WebTitan to be a web content filter for Managed Service Providers that offers everything MSPs could reasonably ask for to best meet the demands of their clients. Our multi-tenanted solution is full of features to help MSPs save time and money. WebTitan works on any operating system, client accounts can be up and running within 20 minutes, and fully automated updating minimizes the management overhead while ensuring maximum protection from web-borne threats. Furthermore, WebTitan is available in white label format with a choice of hosting options. Find out more about how you can benefit from competitive pricing strategies and aligned monthly billing cycles by downloading our MSP Program brochure. Alternatively, if you would like to discuss becoming a TitanHQ Certified Partner, speak with our MSP Program Director Conor Madden on +1 813 304 2544.